Good Morning Everyone! Today's Tuesday Tool are the Watercolor Pencils. You can use them alone to color stamped images or use them with a blender pen, watercolor brushes or Aqua Painter for beautiful effects on your project. They come in 24 assorted colors and are packaged in a sturdy tin container. If you’ve always wanted watercolor pencils but have been holding off, now is the time to get them. Stampin' Up's Watercolor Pencils are among the best on the market. It is so easy to get a professional watercolor look when you blend the colored images with an Aqua Painter or blender pen. After stamping a design, color the desired area with the pencils, then paint with water or a blender pen and watch the colors come to life! 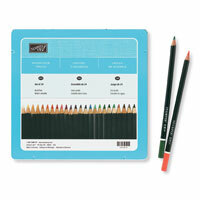 For more vibrant color and shading, color your artwork again while the paper is wet. You can also make a palette on scratch paper by scribbling a section for each color. Pick up the color from the scratch paper with an Aqua Painter or blender pen. For easy opening, squeeze the two back corners of the tin; the lid will pop open. These pencils are made by a renowned manufacturer of high-quality art products. Because the pencils are precision engineered, the leads are centered in the wood barrel, making the pencils easier to sharpen without breaking the tip. This, in turn, will help the pencils last longer. If you would like to order the Watercolor Pencils, click here.